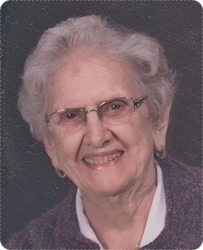 Grace (DeZwaan) Wenger, age 97, of Caledonia, entered her heavenly home to join her Lord and Savior, Jesus Christ on Monday, September 3, 2018. Grace enjoyed fishing, sewing, painting, and spending time with her family. A loving wife, mother and grandmother, she will be deeply missed by her husband of 74 years, Clifford; sons, Larry (Mary) Wenger, Tom (Paula) Wenger; daughters-in-law, Barb Wenger, Patricia Wenger; grandchildren, Carrie Wenger, Amy (Peter) Cerra, Craig Wenger, Mike Wenger, David (Jenny) Wenger, Dan Wenger, Julie (Randy) Wissink, Michael Wissink, Sara Wenger, Diana Wenger, Steven (Janet) Wenger, Kim Wenger, Lisa (Jay) Vonk, Jackie Wenger, Jonathan Wenger, Ryan Wenger, Aaron Wenger; several great grandchildren; brother-in-law, Howard (Cheryl) Wenger; and many nieces and nephews. Her sons, Ron and Ken Wenger, a sister and two brothers, preceded her in death. The family will greet visitors on Friday, September 7, from 2 - 4 and 6 - 8 pm at Stroo Funeral Home. The funeral service will be held 11 am Saturday, September 8, at Grace United Reformed Church, 9255 84th St. SE, with Rev. Michael Schout officiating. Interment in Chapel Hill Memorial Gardens. Memorial contributions may be made to Grace Reformed Church.